The 9 Best Spots for Noodles in Maine! From spicy miso to piping hot bowls of ramen, noodles are the ultimate comfort food. Across the state of Maine, from pho restaurants to noodle bars, you’ll find a truly delicious variety. Here are the best noodle places in Maine! Choose from rice noodles, sora hosomen sun noodles, yakisoba noodles, and more at Anju Noodle Bar. Feast on tasty dishes including Khao Soi, Shio Paitan ramen, and spicy miso ramen. These are only three options at this trendy spot that has as much ambience as it does flavor. Customers love the explanation they receive from the staff on how to build their soup bowls. The ingredients are all fresh, making the ramen or egg noodle dishes incredibly flavorful. You’ll love the noodles at Veranda Noodle House. Choose from lo mein noodles, wild rice noodles, vermicelli noodles, and more in delicious dishes like drunken noodle, Thai Radnar and Chow Foon. The service here is top-notch, too. Feast on Chinese yellow noodles with roasted pork, Chiang Mai curry noodles with local chicken or ramen at Long Grain. These are just a sampling of the amazing dishes on the menu at this spectacular restaurant. The ambience is as rich and flavorful as every appetizer, soup, and entrée they serve. You can’t go wrong here. Several pho noodle bowls grace the menu at PHOever Maine. Choose from seafood pho, pho with tofu, pho ga chicken, and more. If you prefer vermicelli noodles, they’ve got that, too. Try their Bun Thit Nuong for a change of pace. The Thai Noodle Soup at Pom’s is famous throughout the city of Portland—and beyond. The spicy peanut base combined with noodles, beans sprouts, scallions, and cilantro make for a spicy way to indulge. 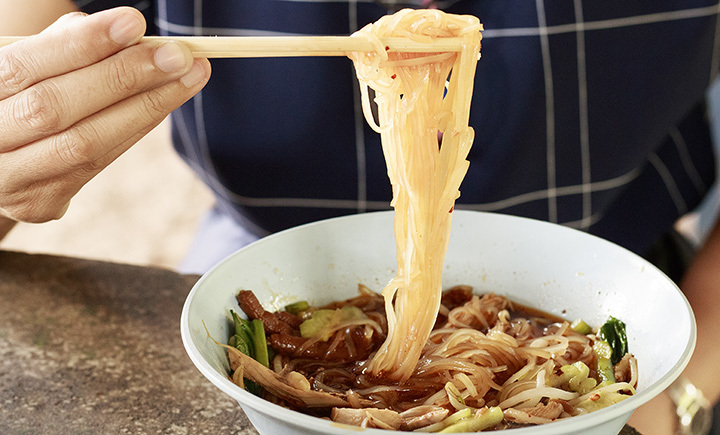 Check out their other dishes, too, made from a variety of noodles including bean thread noodles, rice noodles and egg noodles. Whether you’re craving Pad Thai or a bowl of delicious noodle soup, you can’t go wrong with any of Maine’s three Mekhong Thai locations. The service is excellent and the noodle dishes are truly unmatched! You’ll enjoy noodle options galore at Tasty Thai. Indulge in Pad See Ew or Rad Nar. Maybe you’d prefer a bowl of duck noodle soup. Eat in or take your food to go. Customers love that they can order online, too. Select one of several rice noodle or egg noodle soups at Bamboo Bistro. Chow down on a vermicelli noodle salad. Go all out on an entrée like Crispy lo mein or drunken noodle. No matter which way you order your noodles, you won’t be disappointed.